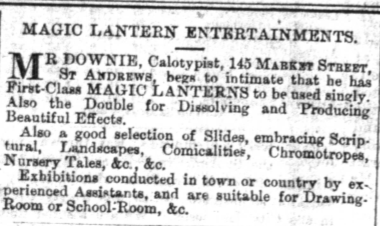 St Andrews Citizen, 8 May 1875. On 10 May 1875, the local paper reported a ghost in St Andrews. In Hull, there were similar tales of a “spectral visitor”. The Chester Observer told stories of a spirit as “distinct as flesh and blood…pierced in vain by swords”. The man behind these eerie manifestations was John Pepper. Pepper travelled the UK showing off his “ghosts” – optical illusions – to people across the country. When he came to St Andrews he promised “Angels that float in space” and “Spectres that creep up walls”. It’s hard to believe that a show this ambitious could have been put on in the 1870s, a time before cinema or television even existed. Contrary to popular belief, a vibrant culture of optical illusions and projection based entertainment existed long before the often-quoted “birth of the cinema” in 1895. How was Pepper able to “summon” the ghosts which performed in his travelling show? By the careful arrangement of mirrors, actors and a device called the magic lantern. The magic lantern is in many ways a precursor to the cinematic projector. Like the projector, the lantern harnesses concentrated light to magnify small images. These images are then projected onto a larger screen. Rather than projecting film reels, lanterns used images on glass slides. Showmen would use it to tell stories, and sometimes even create moving images. Pepper – and his former partner Dircks – decided to project the image of a person rather than a lantern slide. It was this trick – now known as the “Pepper’s Ghost” technique – that allowed them to create the ghostlike recollection of a person on stage. One way to imagine what this technology may have looked like is to watch the works of Musion – a company which specialises in Holographic projection. Musion’s holograms are based on the same trick that Pepper popularised centuries ago. Musion projects videos rather than using live actors, but the basic effects of the trick are similar. 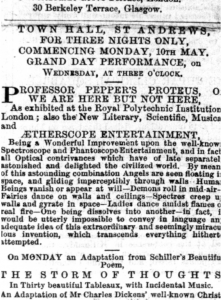 Like Musion, Pepper used his ghosts as part of a wider show that his audience was already familiar with. The ghost shows would include short scenes from popular plays of the era. In St Andrews for example, the show included extracts from Dickens’ A Christmas Carol, and an adaptation of Faust. Instead of using a costumed actor, Pepper used his trick to play the ghosts in these scenes. His ghosts had the ability to dissolve into thin air and disappear through walls – not something that a traditional actor could offer! Given the supernatural slant of his show, it may seem strange that Pepper was actually trying to encourage scientific thinking. Pepper was honourary professor at the London Royal Polytechnic. The Polytechnic’s shows were famous throughout Britain. They aimed to expose the “supernatural” magicians of their era by explaining the secrets behind their tricks. In the case of his Ghost, however, Pepper sometimes felt compelled to keep the magic alive. He did not always give the audience a rational explanation for what they saw. 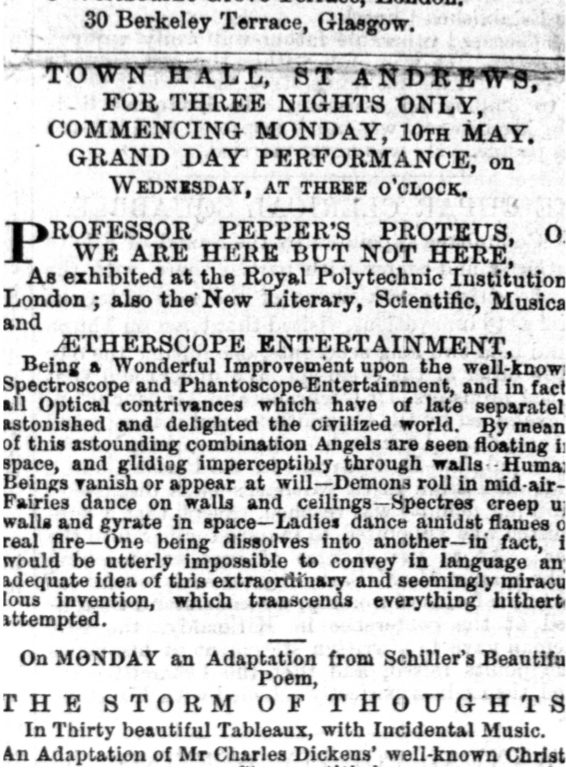 Victorian audiences were fascinated by “scientific progress and educational spectacle”. Groups like the Royal Polytechnic were caught between the chance to entertain and the desire to educate. The story of Pepper’s Ghost speaks to a time when scientific and popular interests were – often uncomfortably – intertwined, and to a history of visual media that stretches earlier than the “beginning” of cinema. To read more about Pepper’s legacy in St Andrews, click here. St Andrews Citizen, 8 May 1875, 1. The Hull Packet and East Riding Times (Hull, England), 25 September 1863, 5. Helen Groth, “Reading Victorian Illusions: Dicken’s Haunted Man and Dr Pepper’s Ghost,” Victorian Studies 50.1 (2007), 43-65. Laurent Mannoni and Richard Crangle. “The Royal Polytechnic Institution.” The Great Art of Light and Shadow: Archaeology of the Cinema (Exeter, Devon: U of Exeter, 2000), 264. Jeremy Brooker, “Pepper’s Ghost, Metempsychosis and the Magic Lantern at the Royal Polytechnic Institution,” Early Popular Visual Culture 5.2 (2007), 189-206.